It's the weekend and already I am tired from the up coming week and what lay ahead of me. Saturday - Two baseball games one for R4 and one for R8, get hair cuts in between games for all three boys. Paw-Paw will be here so that means dinner out and a late night. Whew! I'm tired from just typing it. Truth is I really love it! I love the ball park and everything about it. But since it looks like I have a full count (pun intended) I mean full week I am going to take a bloggy break next week. My schedule isn't allowing me the free time I have in the evenings to hang out on the internet. I hope everyone has a great weekend and a great week and I'll see you when I get back provided I don't take up residence in the dugout due to all the time I will have spent at the ball park. Oh and I need to send a shout out to Tammy, who turned 28 this past week and who's diapers I used to change! Love ya!!! And to her sister, Christi, who turns 30 on Saturday. Happy birthday!! I love these girls even if I was their babysitter when I was oh so much younger. Have a good bloggy break. And, yes, don't you feel old when the people you used to babysit are now almost 30 and have their own children. Wow! That's A LOT of baseball for one week! 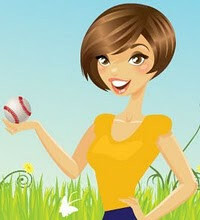 Enjoy your time at the field and enjoy your bloggy break! hope you survived the weekend! I know you are busy this week and I just wanted to let you know that I am thinking of you : ).